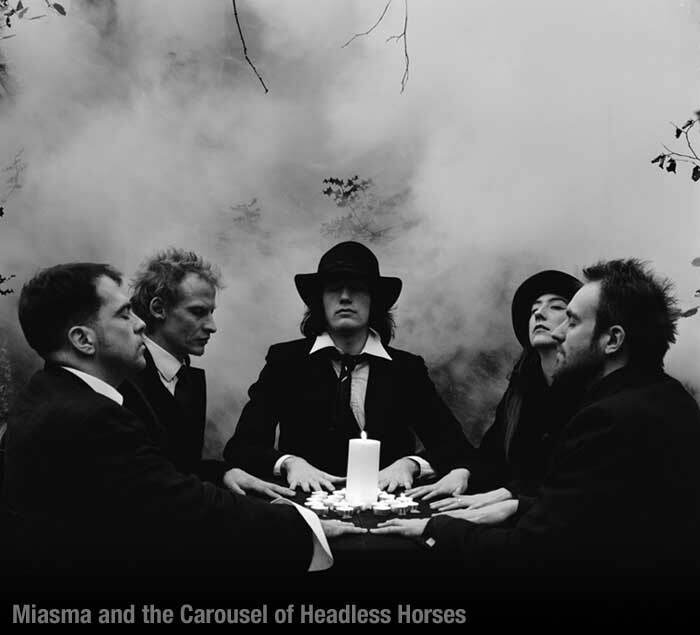 Miasma & the Carousel of Headless Horses are a British instrumental quintet that plays dark, antiquated sounding music encompassing elements of Eastern European folk, avant-rock, broken-down calliope music, and neo-classical film composition. In keeping with Mimicry tradition, their music can only be compared to many artists at once: in this case Angelo Badalamenti, Astor Piazzolla, Goblin, Art Bears, Burzum, Tom Waits, Antioch Arrow, King Crimson, Bach and Univers Zero. More a trip to an anachronistic world of neo-baroque psychedelia than a simple study in diced-up ecclecticism, the music on Perils sways between lush chamber orientated melancholia, apocalyptic bombast, and epic ghost train high-drama. official miasma & carousel of headless horses myspace page. It’s a Mimicry pride to present this band's debut album, and we feel that great things lie ahead of them. To introduce the band a little further, Miasma and the Carousel of Headless Horses consists of Daniel O'Sullivan and Dave Smith from the trio Guapo, a recent offspring from the hereditary line of Magma and the Ruins (Cunieform/Ipecac), Orlando Harrison from the pop band Alabama 3 and Amal Gamal Ensemble (members of Coil, Cyclobe, and Shockheaded Peters), David Ledden from bleak country act Knuckles, and Sara Hubrich who travels around Europe collaborating with the likes of Julian Klein, Tadashi Endo and Fran Barbe. 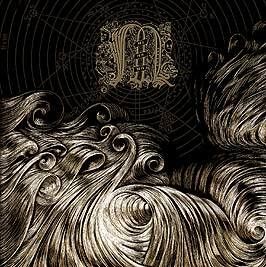 Miasma & the Carousel of Headless Horses are, to say the very least, a striking sounding ensemble. 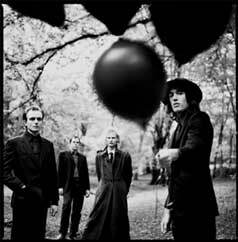 On the Perils recordings, with their harmoniums, autoharps, violins, violas, pianos, organs and glockenspiels added to a top of the line rhythm section, the band very deliberately adheres to a Faustian melodrama of the angelic. Their dark, harrowing visions of some dense hellish musico-psychological dystopia shapeshift frequently before your eyes (ears), and become a very capable and Elizabethan sounding prog-baroque meteorite at the drop of a hat. Armed with these anachronistic tendencies the Miasmic vision never deviates, deriving its vocabulary exclusively from alchemically lined volumes in their arcane library of musical ideas. It's instrumental music that would perhaps find a happy home in a Jan Svankmajer or Fritz Lang film, and will find a prominent place on the shelf of any conniesuer of occultist highbrow, right next to his/her John Dee volumes. (sigh) Yes, dear to our hearts.